Layers are like transparent sheets stacked on top of one another. Each layer can contain different images that appear on the Stage. You can draw and edit objects on one layer without affecting objects on another layer. Layers in a document are listed in the left column of the Timeline. Before you can work with a layer, you need to select it, or make it active. 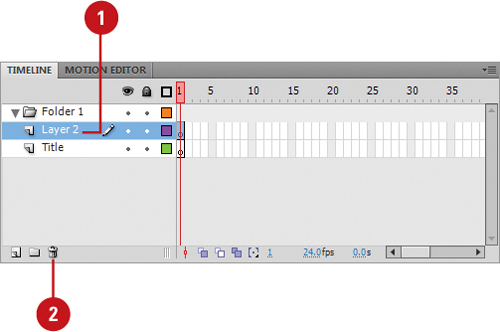 A pencil icon next to a layer or layer folder indicates it is active. Only one layer can be active at a time, even though you can select more than one layer. A new document comes with one layer, but you can add more to organize content on the Stage. As you create multiple layers of related content, you can create layer folders to make it easier to manage the layers. 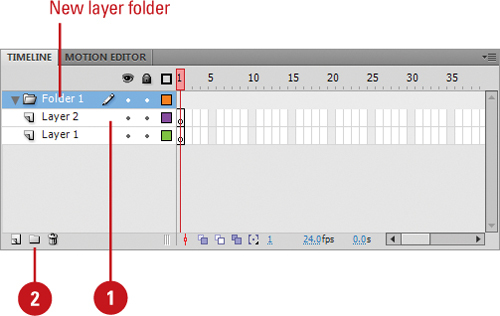 Click the layer or folder above which you want to insert a layer. The new layer appears above the selected layer. Flash names layers in order based on the highest number. If you add Layers 2 and 3, and then delete Layer 2. 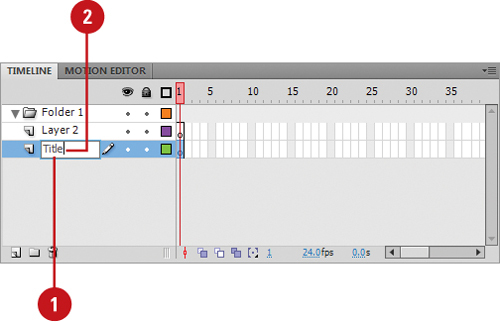 The next time you add a layer, Flash names it Layer 4. Click the layer or folder above which you want to insert a layer folder. Click the New Folder button at the bottom of the Timeline. The new layer folder appears above the selected layer. Double-click the name of a layer or folder. Press Return (Mac) or Enter (Win). Select the layer or folder you want to delete. Click the Delete button at the bottom of the Timeline. There are several ways to select a layer. You can click the name of a layer or folder in the Timeline, click a frame in the Timeline of the layer you want to select, or select an object on the Stage that is located on the layer you want to select. You can select multiple layers. To select contiguous layers or folders, click the first layer or folder, and then Shift+click the last layer or folder. To select noncontiguous layers or folders, Ctrl+click (Win) the layers or folders you want to select.